Casa de Pepe is a traditional Andalucian cortijo with fantastic mountain and sea views from its two terraces. Casa de Pepe (CR/MA/01064) is a jewel nestling in the mountains below the Moorish village of Comares. 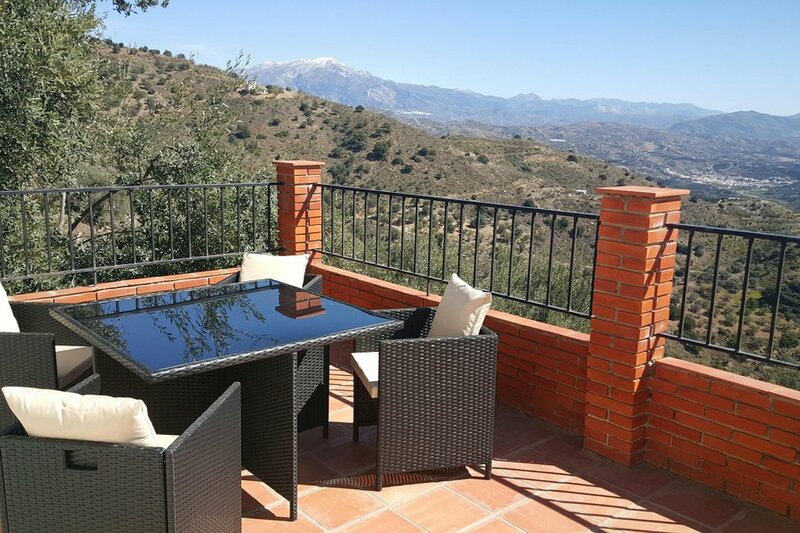 From its 2 terraces you have fantastic views over the Sierra Tejada mountains, the Mediterranean and the Montes de Malaga. the house itself provides peace, quiet and relaxation, but a car ride away and you can be paddling in the sea, enjoying Lake Vinuela, shopping in the local markets, or climbing La Maroma. Granada, Ronda, Cordoba and Malaga are easily reached for a day out exploring the Axarquia region. Smurf village or a flock of flamingos?? All within reach of Casa de Pepe. The property comprises of a large patio and covered terrace area on the ground floor, leading into the indoor dining area, kitchen, 2 bedrooms (1 double and 1 twin) and the bathroom. There are stairs leading to the large and airy living room with doors out onto the upstairs terrace. This terrace can also be reached via an external staircase. There is a private plunge pool (3.6m/12ft diameter) for cooling off on the hot summer days and a gas BBQ for al fresco dining. Comares village is beautiful with excellent walks in and around its Moorish walls. There are bars, restaurants, a supermarket, banks and a pharmacy, as well as a fort and a church to explore. There are several walks in around Comares, all clearly signed, as well as climbing and an incredible zip wire. Several of the villages around Comares also offer traditional Spanish cuisine, and the many ferias and local events mean that whatever time of year Comares has something to offer. With an average 320 days of sunshine a year, this area of Spain makes an ideal all year round destination. Indeed, La Alqueria is set in a micro climate, and isn't affected as much by the winds and so it is usually still warm enough to sit outside during the day time even in winter, although the nights are cold once the sun goes down. If you holiday over the winter you will be able to see the snow capped peak of La Maroma from the terrace and enjoy the wood fire in the living room. In the summer, the south facing aspect makes it a sun worshippers paradise, the covered terrace provides a shady and cooler place to sit if you want to get out of the sun. As the house is built in the traditional style, the walls are thick and so inside the property it remains cool even during the summer months. Within the property there are steps to the bedrooms and to the kitchen which would make it unsuitable for a wheelchair user. The surrounding area is also hilly and so may not be suitable for those with mobility issues. Tea/coffee making facilities are available and a free welcome pack is provided on arrival for stays of 3 nights or more. (Upgrades are available, please ask for further details). Comares is approximately 700m above sea level and is known as the Balcony of Axarquia. The Tourist Information in Comares is located in La Plaza Balcon de La Axarquia which is the main square as you enter the village. From here you will also find bars, restaurants, shops, banks and post office, tobacconist and the pharmacy.